I’m so excited to announce that this week I get to be a part of the Frugal Family Food Collab! It’s an ongoing playlist collab and every Friday and new video is added with a budget friendly meal idea! If you’ve been around my channel any length of time then you know that I love to save money, shop deals, repurpose supplies, etc so I am of course all about cooking on a budget. This week I’ll be showing how to make a one pan meal that I call Tex-Mex Skillet. It is easy on the budget and only takes about 25-30 minutes to make! 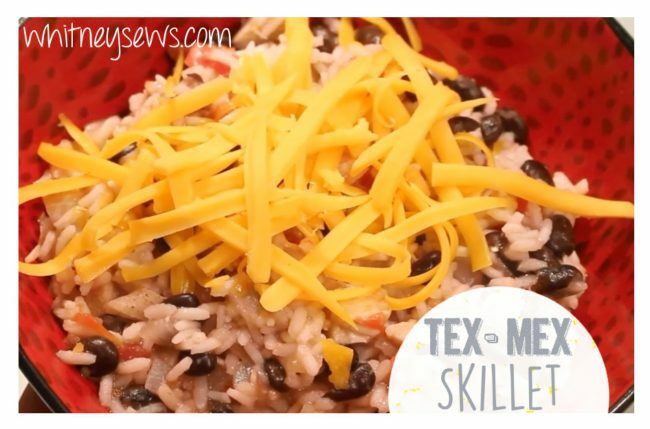 Watch my Tex-Mex Skillet video HERE! Place the chicken and onions in your skillet that has been preheated on medium heat. Add the taco style seasonings you like. Also add the liquid from the can of tomatoes. Once the onions have cooked a bit and most of the liquid is absorbed add the rest of your ingredients. Turn the heat up to high and bring everything up to a simmer. Turn the heat back down and cover the skillet. Cook for about 18 minutes or until your rice is cooked. Serve and enjoy! We like to eat ours with cheese on top and tortilla chips on the side! I hope you enjoyed this recipe! It is delicious, easy, and definitely frugal! If you’re interested in seeing more frugal meals you can find the entire Frugal Family Food playlist HERE! Make sure to come back next Wednesday for a new tutorial! This entry was posted in Blog, Feature Friday and tagged Collab, Cooking.